One of the services Take This provides, as I mentioned earlier, are AFK Rooms. The term AFK is an internet shorthand for "away from keyboard," which is a way to let others online know you need a break and are stepping away temporarily. These AFK rooms at conventions provide people who need a break from the often overwhelming noise and chaos of a large convention an opportunity to go someplace quiet where they can collect themselves. The AFK rooms also have counselors and therapists as volunteer staff who can provide support to those in need. The Take This Project just completed a successful Kickstarter campaign to raise funds to continue and expand their services. They raised nearly $39,000, well over their $10,000 goal! They are still able to accept donations, of course, so check out their website and help support the cause if you can. If you are unable to donate money to Take This, they often can still use volunteers. Please contact them if you’re interested and available. Take This has a wide reach both at conventions and online. They recently posted a page to their website linking to our PAX South 2016 video in which we discuss four of the many benefits of playing role-playing games like Dungeons and Dragons. Within a few days the video broke 1,000 views! 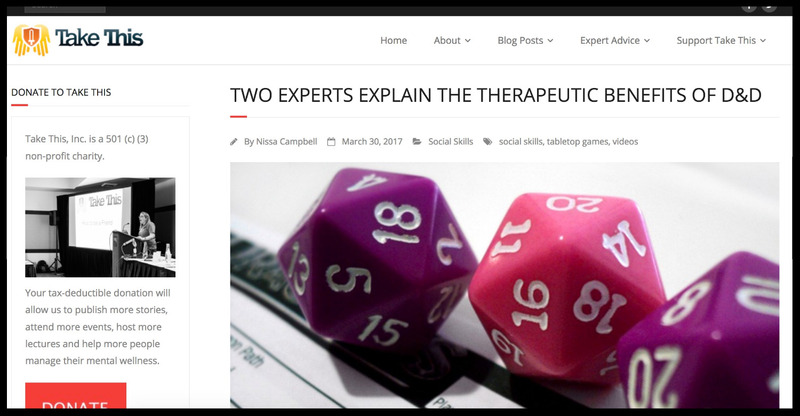 Two Experts Explain the Therapeutic Benefits of D&D. We’re big supporters of Take This. 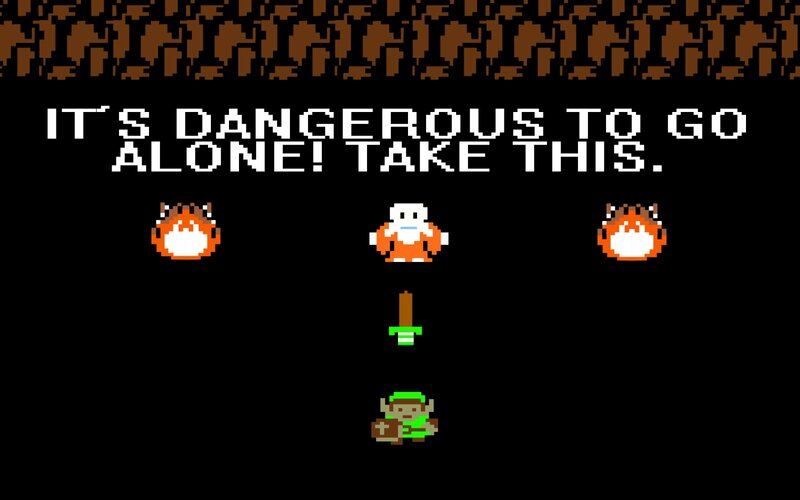 After all, it’s dangerous to go alone. Follow us on Twitter and Facebook, and stay tuned for the audio recording of our PAX East talk!